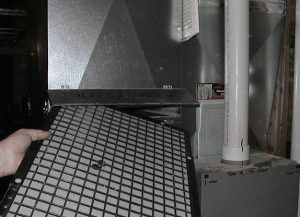 Servicing furnaces with reusable furnace filters is easy and saves money. This reusable filter is dirty. But it can be cleaned and re-used many times. Servicing furnaces periodically ensures that they operate safely and efficiently. The most important maintenance task that you can do yourself is changing the filter. The filter in your furnace or heat pump protects the blower fan, heating coils, and cooling coils from dust, dirt, hair, and other debris. If these heating components get dirty, they are difficult and expensive to clean. Changing or cleaning your filters helps protect this critical equipment, and improves both heating and cooling efficiency. You should change or clean your furnace filter every few months – check yours periodically to see how quickly it gets dirty. The most common filters are made of a fiberglass mat mounted in a cardboard frame. These are disposable, and you can buy them from home improvement stores.Other filters are made of washable plastic fibers. You can clean these with soap and warm water either in the bathtub or outdoors with a hose. Other filters are made of washable plastic fibers. You can clean these with soap and warm water either in the bathtub or outdoors with a hose. Most furnace maintenance tasks should be performed by a professional. Have a heating contractor perform the following cleaning chores and safety checks every few years. Measure the furnace’s combustion efficiency, and make the required adjustments to ensure that the system is operating at its peak efficiency. Confirm that the chimney removes combustion gasses from the home under all conditions. Make sure the chimney is clear of any obstructions, like bird nests. Clean the air-conditioning coil. A dirty A/C coil impacts both heating and cooling. Clean the blower. Oil the blower motor as needed. Check for cracks or holes in the heat exchanger. A damaged heat exchanger is a hazard to a building’s occupants. If you hire a heating contractor to perform periodic maintenance, it also gives you a chance to learn more about your heating system. Ask the technician where the filter is, and how to change it. Also, find out where your system’s main power switch is, so you can turn the system off in an emergency. Are you an HVAC technician? We have a few products and courses that you might interest you. This lesson covers the three main furnace types and the factors that most affect their efficiency. You will learn about the following. How to detect signs of incomplete combustion. How to diagnose common gas-combustion problems. How blowers, filters, and ducts affect forced-air system efficiency. This lesson covers the science of gas combustion and the major components of gas-combustion devices. You will learn about the following. Gas-combustion reactants and combustion products. Suitable venting systems that vent combustion byproducts to outdoors. The Saturn HVAC Systems Field Guide contains a wealth of job-tested procedures for improving the safety and efficiency of furnaces, air conditioners, boilers, evaporative coolers, and domestic water-heating systems. This 8.5×11 durable two-sided sheet covers combustion testing, combustion standards, gas-input measurement, troubleshooting, and worst-case draft and pressure testing.